Once again a question from a student has inspired an idea for this blog. 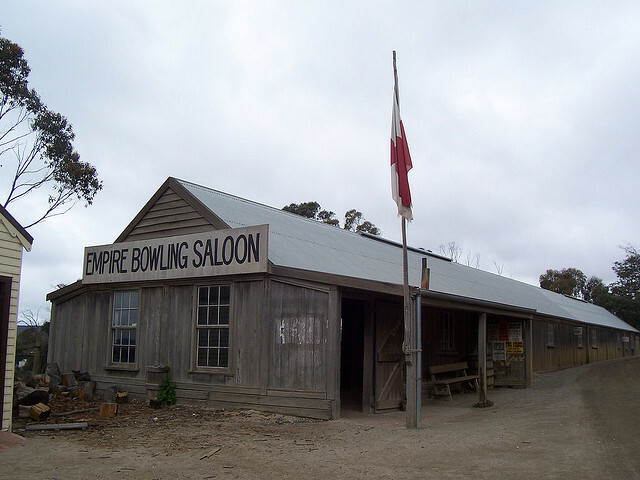 A student from Wesley College, Clunes campus wanted to know more about bowling saloons on the goldfields, similar to Sovereign Hill’s Empire Bowling Saloon. This turned out to be quite a challenge, as there isn’t much information from the time about this sort of sporting or gaming entertainment. 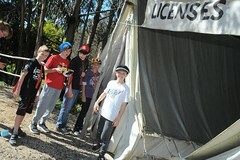 However, we have managed to find some information about them. Washington Bowling Saloon, next to Bentley’s Eureka Hotel, which burnt down during riot after death of Scottie Scobie. Empire Bowling Saloon, probably on Main road Ballarat East. 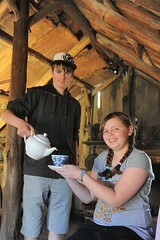 Which is the name of Sovereign Hill’s Bowling Saloon. The Eagle Bowling Saloon, next to John O’Groats Hotel. The Exchange Billiards and Bowling Saloon, opposite the United States Hotel. Here is an advertisement for the Empire Bowling Saloon from the Ballarat Times, 30th September 1856; This recreative piece of innocent amusement and excellent room for pastime still continues to hold its position as one of the most agreeable resorts on the Main Rd of Ballarat for those who delight in healthy exercise. The visitor meets with the utmost civility from the admirable management displayed in the saloon and we would advise our readers to pay this commodious establishment a visit and certainly guarantee that if they do they will soon pay a second, aye, and a third one, too. It seems this saloon was surrounded by claims and was in danger of being undermined, or forced to move. The Geelong Advertiser, 22nd January 1855 has an article mentioning the saloon and its close proximity to many “shepherded” claims. Most saloons were next to hotels, and they worked well together, as bowlers would get thirsty, and drinkers might want a bowl. Some saloons had licences for selling grog, but some didn’t. As we see from this article from the Melbourne Argus, 6th September 1855 about the Eagle Bowling Saloon, sometimes the selling of alcohol and running of the bowling saloon could be muddled. In general, the hotel would be licenced to sell alcohol, and would provide this service to the saloon. Unfortunately we have only been able to track down two images of bowling saloons or alleys in Ballarat, and both are S T Gill sketches. Site of Bentlys Hotel, by ST Gill. Courtesy of Gold Museum Collection. The first is actually a sketch of the site of Bentley’s hotel, by Samuel Thomas Gill, with the façade of the Washington Bowling Saloon in the foreground. 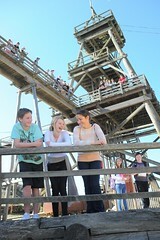 Unfortunately it tells us little about the building itself except that it was a very simple construction. 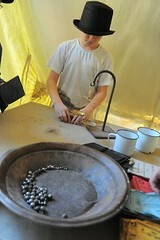 Sunday at the Diggings, by ST Gill, Courtesy of Gold Museum Collection. The second is entitled “Sunday at the Diggings”, also by ST Gill. Its main purpose is to illustrate the general godlessness and waywardness of many of the diggers on Sundays compared with the ways of the ‘true brethren’. The existence of the Bowling Saloon illustrates this intemperance, along with dancing, drunkenness and other vices. 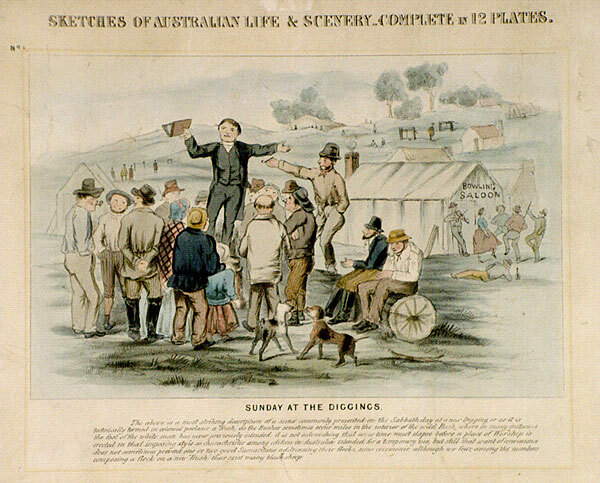 All that can be fairly deduced from this picture is that obviously bowling saloons were a fairly common sight on the diggings, and they represented a ‘lower’ form of amusement. It’s very hard to determine which form of bowling was played in which saloon, as the names of the styles of bowls seem to have been used carelessly to describe the games being played. We do know that both nine and ten pin bowling were played on the goldfields, and generally nine pin is called “English Bowling” and ten pin is “American”. Both names were interchangeable and sometimes the term “Skittles was used to describe these games. Skittles is a completely different game using four pins. 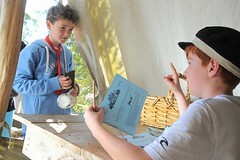 We can find no evidence of real skittles being played on the goldfields. 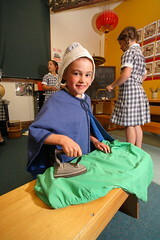 Bowling alleys and saloons on the goldfields would not have been elaborately constructed buildings. Ease and speed of construction would have been the main criteria, and there may have been a need to move the premises, as happened to some businesses on Main Rd Ballarat East when the area was finally surveyed. 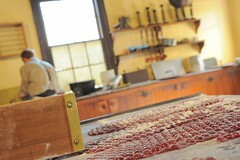 Empire Bowling Saloon, Sovereign Hill. 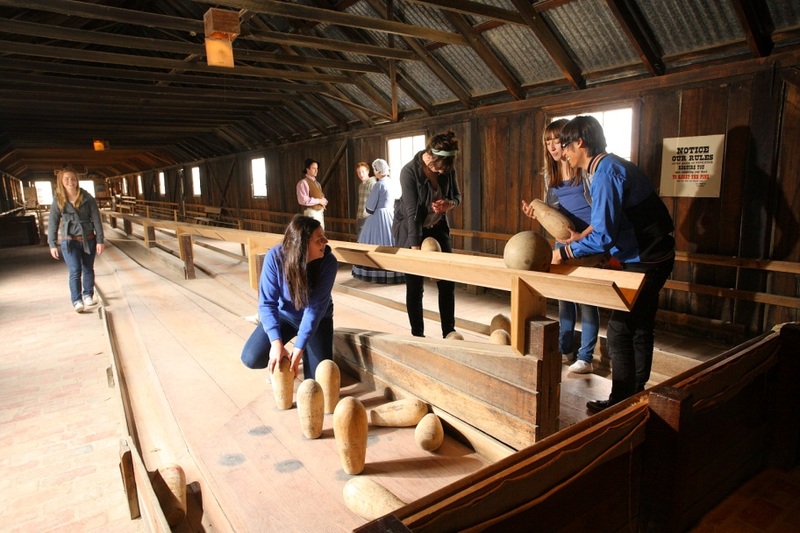 Sovereign Hill has its own bowling saloon. This is designed to represent the Empire Bowling Saloon. It is of a fairly simple construction, the only ‘facility’ a wooden counter, to serve drinks and provide supervision. The game played inside is the “true English game” of nine pins, replicated from the town of Tanunda in South Australia, where the game is still played. The Lanes are 131 ½ feet long, there is a ramp between the two lanes to return the bowls for the next player. The bowls are made from lignum vitae, a special kind of hardwood, and the pins are made from wood as well. The scoring is somewhat different to ten pin, or “American bowls”. The highest score requires you to leave the front pin standing, and knock all the others down. 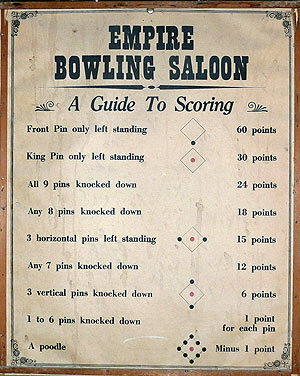 Knocking all nine pins down is the third highest score. 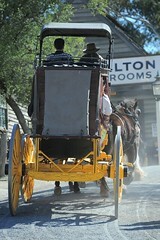 This entry was posted in Sovereign Hill, Victorian Gold Rush and tagged 1850s lifestyles, bowling, entertainment, gold rush, historical recreations, Wild Boys. Bookmark the permalink. I had no idea a bowling alley went down with the Eurake Hotel. This is a great article that make me wanna bowl. Thanks for this great post. What a fascinating topic! Will make me look at this sport with new eyes now that I have some understanding of its history. 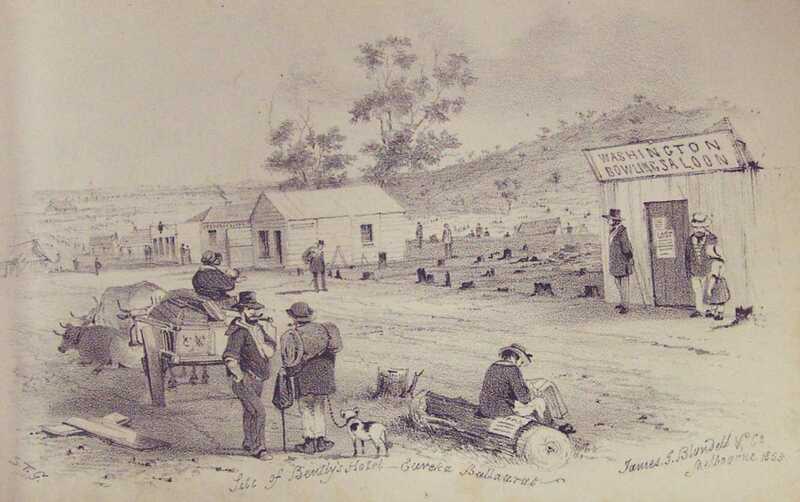 There was a bowling saloon at the St Nicholas Hotel, Main Street Ballarat, in 1865. 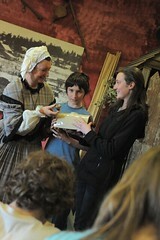 See the Ballarat Star for March 8, 1865. Named the American Bowling Saloon, run by Bernard Morris who had American connections.